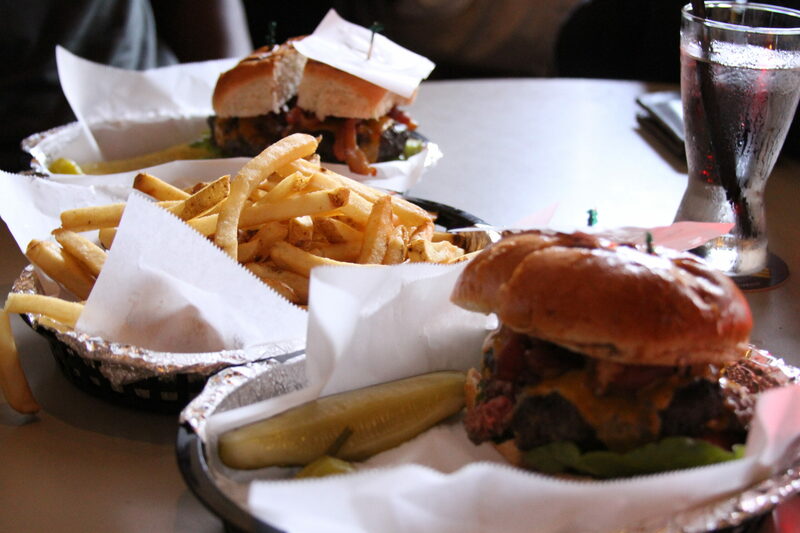 There is no shortage of great burger joints in Austin. If you’ve been looking for the best burgers in Austin you’ve come to the right place. This post is part of a series on The Austinot. All the posts in the series will start with “Search for the Best Burger Joint in Austin” in the title. You’ll always get an honest take on the burger joints that I’ve visited. Keep in mind that these are just my opinions. I’m sure you may agree or disagree, and I’m good with that if you are. Regardless, I’d love to hear your thoughts. 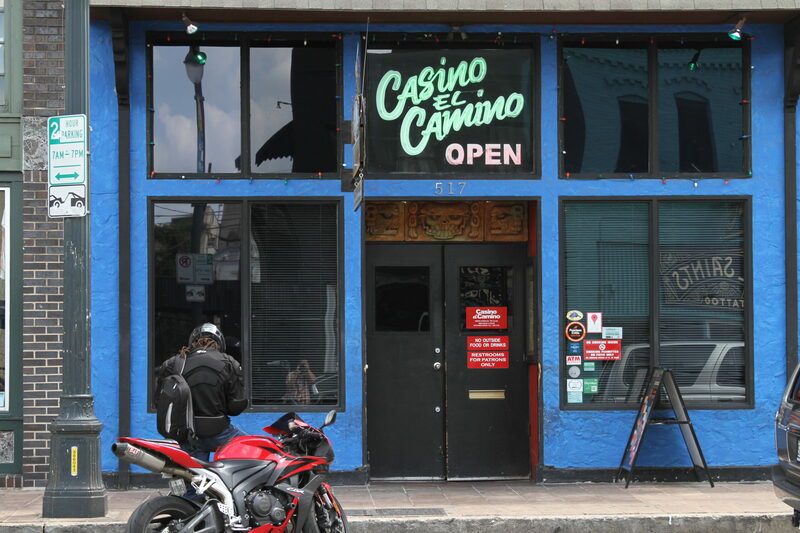 Casino El Camino is not hard to find. It is right on the famous 6th Street, just west of Red River. As you enter the place, your senses are immediately assaulted. Though the place is poorly lit, as soon as your eyes adjust it’s obvious that Casino has a character all its own. 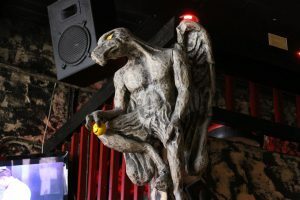 There is a leering gargoyle statue that hangs from the bar and seems to be watching the patrons as they file in. In addition, large scale murals line the walls, providing even more for your eyes to feast on as you find a seat. The music is loud. Very loud. Way too high in volume to hold a conversation without shouting, but that doesn’t stop people from coming in droves to sample the food. This is a classic bar in Austin. 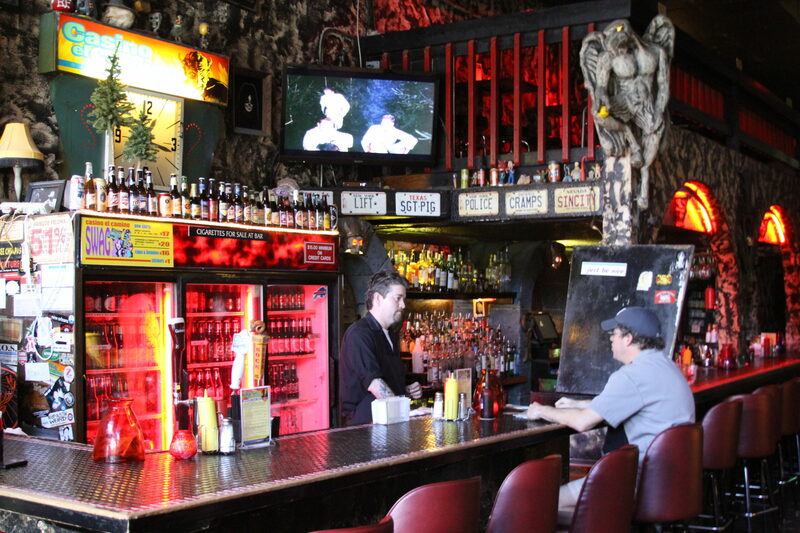 If you’re looking for a dive bar with great food, you’ll be happy you came to Casino El Camino. My server’s name was Courtney and she was cool, friendly and always attentive to our table. For those wondering, I went with the “Chicago Burger,” basically a classic bacon burger with cheese. Fries are ordered separately, so I got a basket of those too. Be prepared to wait for your food. They make everything to order, so a 3/4 lb. burger takes about 25 minutes to get to your table. Roughly speaking, a score of 1 translates to “worst ever,” while 10 translates to “God handcrafted this himself.” Remember, you are free to disagree with me. This is just my honest take. Burger Patties = 9. Massive 3/4 pound patties, juicy and flame kissed. Very hard to get your mouth around and the portion is so huge that the kitchen cuts it in two before serving. What is not to love? Bun = 5. The bun was nicely oiled and the right size, but crumbled apart through the course of the meal, which lowered this from a 7 to a 5. Cheese = 6. Real cheese. I feel like the burger could have had another slice to increase marks. In short, there was nothing wrong with the cheese; it was excellent. But for the size of the burger, the flavor got a little lost. If you are going to make a burger that size, the amount of cheese must match up. Messiness = 9. The burger was nearly perfectly messy. I like a messy burger. Not too messy where it can’t be eaten, but messy enough so that you know you’ve got something special in your hands. Garnish = 6. The tomatoes were fresh, thickly cut and ample. The bacon was crisp and flavorful. The lettuce was not as crisp as it should have been and was the only thing that kept this mark at a 6 instead of a 7. I think on any other day, this mark may have been a strong 7. Taste = 8. Casino El Camino makes a massive burger that will have you coming back for more. Juicy and rich meat with a hint of black pepper and chargrilled flavor. Like you make on the grill…only better. Fries = 8. Their fries are really good. Traditional fries that are somewhere between steak fries and fast food fries when it comes to size. Not too crispy or overdone, but not just a pile of sogginess either. A nice balance of soft and crisp. Note: A basket of fries is more than enough for two people. Atmosphere = 8. Casino El Camino is original. There is no debating that. Well loved by locals and frequented by travelers, this is a do not miss spot. The only thing about when I visited was that the volume of the music was so high that it was hard to hold a conversation. This was a real turn off, but the place is so original that it retains the high mark of 8 in this category. Turn down the music a bit and you get a solid 9 in this mark. Cleanliness = 6. The place was above average clean for a bar on 6th Street. Other Factors = 7. The music selection, though loud, varied greatly and had a little bit for everyone. The staff was cool and friendly, and the service was always quick. Don’t think my water glass ever went under half full; I tipped 30%. Overall Score = 7.2. The overall score is the average of the 10 categories. The burger at Casino El Camino is more than a mouthful. It is so huge that it’s hard to get your mouth around it. It is flavorful and has a small hint of black pepper taste. The bun is sizable, but crumbles throughout the meal. The bacon was crisp and flavorful and the tomatoes were fresh and thick, while the lettuce was just average. If you are looking for a huge burger with a great taste, Casino El Camino will fill that need and more. The price was reasonable for what you get, the server was attentive and hip, and for good reason, Austinites love this place. So give it a shot; it’s definitely worth checking out. #2 – score 8.0 – Your Mom’s Burger Bar (Tied for 2nd so far) CLOSED see below. #2 – score 8.0 – Opal Divine’s Freehouse (Tied for 2nd so far) 6th Street location CLOSED see below. I’d love to hear what you have to say. Do you agree or disagree with me?